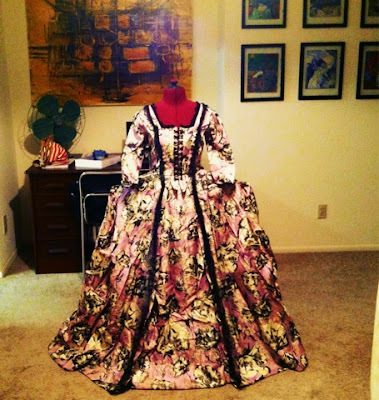 This is a Marie Antoinette costume I designed, and my mom and I made together a few years ago. A good bit of the detail got destroyed, so I've sort ten hours already changing it. There was a bit of pink taffeta, which I've replaced with black because I what it to look more modern, and I want the print, which reminds of of Warhol's flowers, to pop more. I changed the lace edging on the sleeves and neck, all of the stripping detail. I also made some cool taffeta black bows that I want to bead an stitch onto the striping. I also have to press and starch the whole thing and sew it to the dress dummy so it has more of a physical shape for the exhibition. Then, I need to find some sheerling for my next project, and I need to make our Halloween costumes.